A few weeks ago, I posted about empowering students through choice over on Who's Who & Who's New. There was a lot of interest in it, & I got lots of questions, so I thought I'd address the questions & turn it into a little series here on my home blog. I'd been hearing from lots of teachers about how they offered their students choices during workstations, & even as part of formative or summative assessments. I'm gonna tell you right now that at first I thought the idea was nuts. I envisioned all kinds of craziness happening in my room....management issues, behavior issues, and worst of all....little to no learning occurring! I was 'inspired' to take the leap this year (it's one of the choices on our teacher eval rubric....and it was one of the areas upon I chose to focus this year). I've been so thrilled with the impact providing choice has had! Students have a greater sense of control, so they're happier in the classroom & more actively involved in instruction. Student engagement and motivation has increased, so they're paying more attention to their work, and that equals more meaningful learning. Students take more ownership of their learning. Those are pretty big positives up there! Are you ready to get started on providing choice in your classroom? Are you ready to start dabbling in it? Here's a great way to start: offer choice during your workstations/centers. Now I don't mean provide 6 or 8 activities and then set your kiddos free. You can start by providing 3 or so activities from which students can choose. You don't even have to allow all of your kiddos choice at the same time. Here's how it's set up in my room during our ELA block. 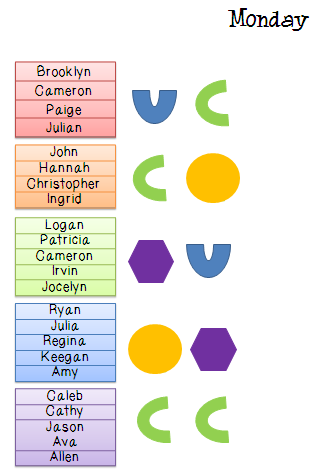 You can see that only two of my groups are in choice each rotation. All of the other groups are at a station that either has an adult to monitor/supervise or at a prescribed activity like a game, etc. I have a small magnetic dry erase board at the front of the room on which I write the day's choices. I actually draw icons or write the word for each station. I think actually watching me draw/write the choices helps my kiddos attend to the choice options. How do you decide what choice activities to offer? Take a look at what skills you're teaching this week, and which skills your kiddos need more practice doing. I recommend choice activities not be a skill you've introduced that same day or even the day before. They definitely need to be something at which your kiddos can be independent. Helping Verbs - Search the Room & a Verb Sort *I won't put this up at least until Wednesday, and maybe even Thursday, depending on how they do with this concept. How do you keep track of who has gone to which station? I really don't track which stations they've gone to. Since each skill has multiple options, it doesn't really matter if Bobby does I Spy Sight Words 2 days in a row. He's getting sight word practice in whether he does I Spy twice, or he chooses I Spy on Monday & Winter Roll & Write on Tuesday. I will say that I do completely pull the options for a skill if I see they no longer need that practice. For instance, if they've really got the sight words for the week down, I might pull that one (really, just erase it from my board). In this case, it ends up setting up a scenario where they're more apt to choose reading as one of their choices. Win-win! 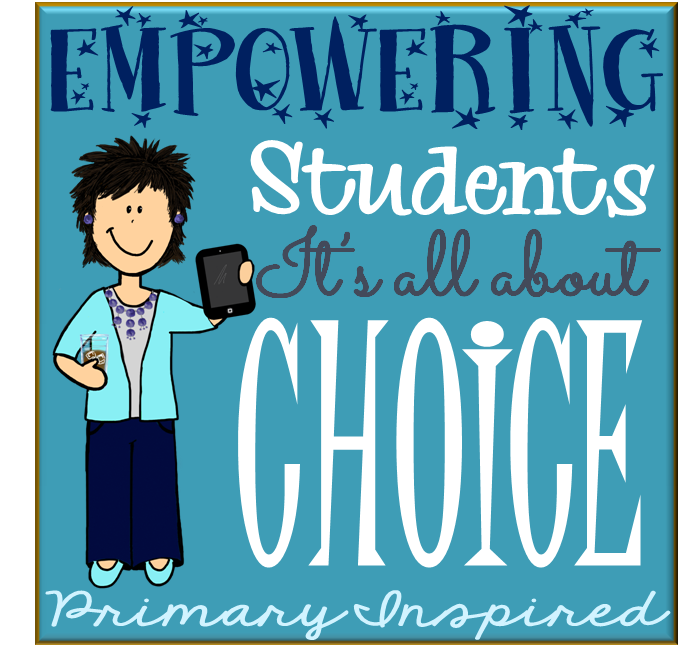 I'd love to hear more about how you provide choice in your classroom! How do you make it work? Are you thinking of starting, but have some more questions about it? Please comment with your questions below, and I'll address it in a future post!